Throughout the history, from most important art movements like Cubism to the later art movements like Abstract Expressionism, revolutionary art movements have played a pivotal role to eradicate the practice of following the art rule books. The evolution in the arts gradually brought change in an artist’s approach – to think out of the box and create something new out of the existing. Today art has a completely different form from what it was in the past centuries; restricted and prescribed. These revolutionary movements have opened new horizons through which today’s artists are free to bring new concepts in the arts. Art galleries, all around the world, have also opened their borders for artists to display work in their countries and provide them a platform through which artists all over the world could connect. When an artist’s work is displayed in other countries except their home country, it’s not only their work that is displayed but it brings an opportunity to communicate with the artists and exchange cultures so the understanding of art between the countries gets mature. United States of America also has a wide history of revolutions and movements in the arts. An art gallery in Washington DC, back in 1976, organized the first American sealer art fair, ‘The Washington International Art Fair’ for a short time. Following the advent of this art fair, many fairs developed throughout the United States. Since these art fairs, biennales and international exhibitions have become a trend and a source of exchanging cultures, United States has also been hosting and participating in different art fairs, biennales and international exhibitions. 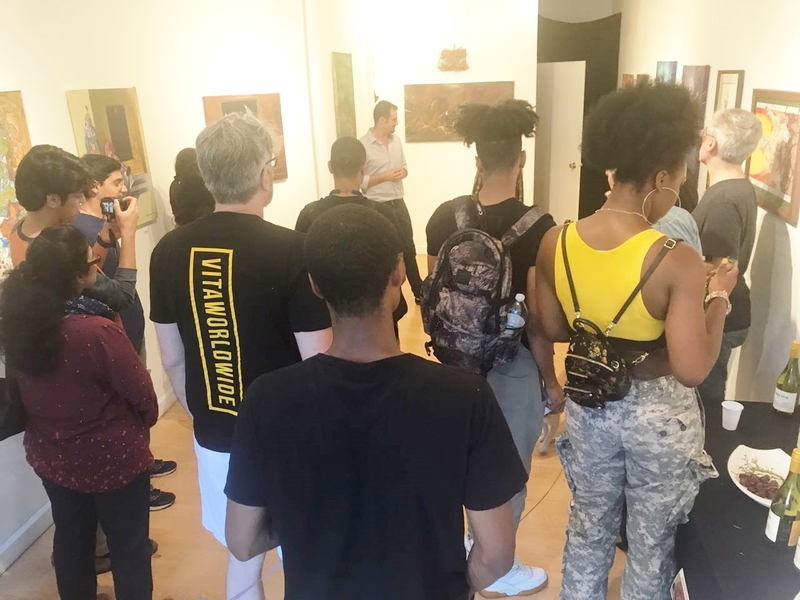 Following the trend, a very well-known art gallery, located in the popular city of USA, New York hosted a group of artists from different countries and held an exhibition, titled ‘Painting Dreams’. Dacia gallery had invited talented and deserving artists from India, South Africa, Morocco, and Pakistan and from all over the USA. The exhibition drew a large number of art lovers, collectors and students. 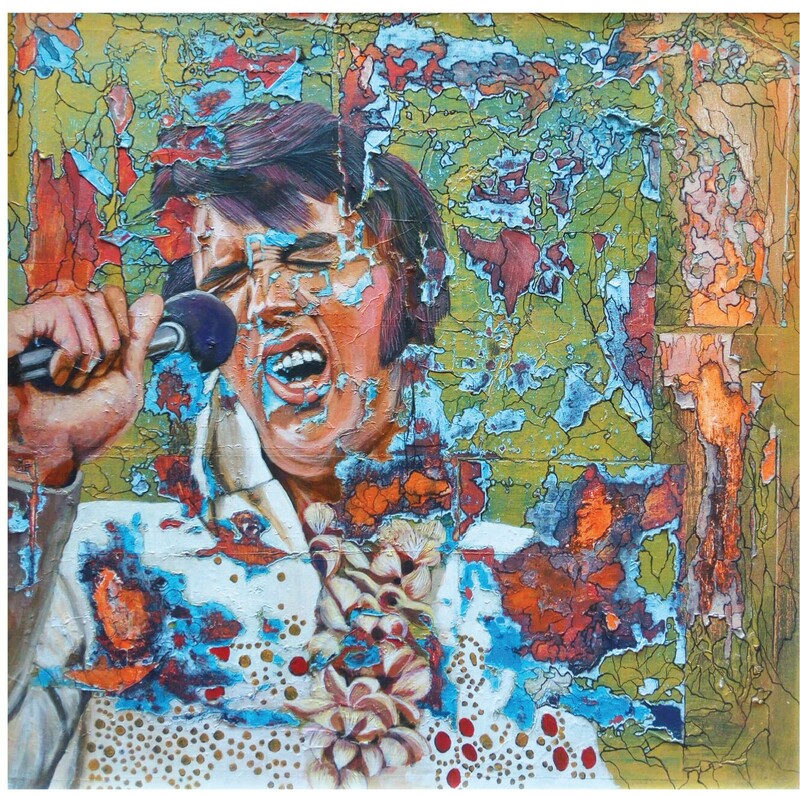 From Pakistan, Sana Nezam, an art teacher and practicing artist, unveiled her talent by presenting her alluring artworks in oil and acrylic medium titled ‘Madonna’ and ‘Elvis Presley’. Nezam preferred painting the portraits which were unique in their own style. She believed that, like art, music is the language that has no boundaries and plays a crucial role in bridging human closer. “As as a quiet and reserved child, I’d often feel a whirlwind of emotion hearing “Express Yourself” by Madonna and I did just that. Her melody is joyous and uplifting, kind of beckoning us all to free ourselves from our own inhibitions and join in to make this world a kinder place. A place where we can not only understand each other but also be understood that we are more alike than different. Our power comes from opening our hearts, to give and receive love without any prejudice,” She explained the interconnection between her work and music. There is no great feeling for an artist when he/she not only represents own country abroad, but also brings pride and recognition back to the country. Lee Vasu, the director of Dacia Gallery, highly appreciated the contemporary work from Pakistan and acknowledged Nezam’s work in his speech at the exhibition. 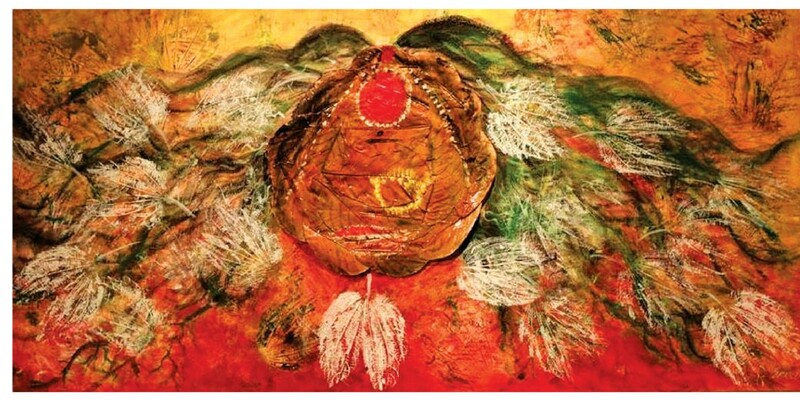 Her work, titled ‘Chakras’, was about a religious belief that allows a human to get in touch with the universe. Using light hues to create a dramatic atmosphere, Agarwal depicted the state of being at the higher level of consciousness where one could think and imagine things differently and beyond in her work. Deepak Vinod Prakash Gupta was a proficient artist from India, who gathered the bits and pieces of his life and shared the experiences and emotions of as a mariner. His work revolved around nature where he tried to show the beautiful moments he loved on a ship around nature. 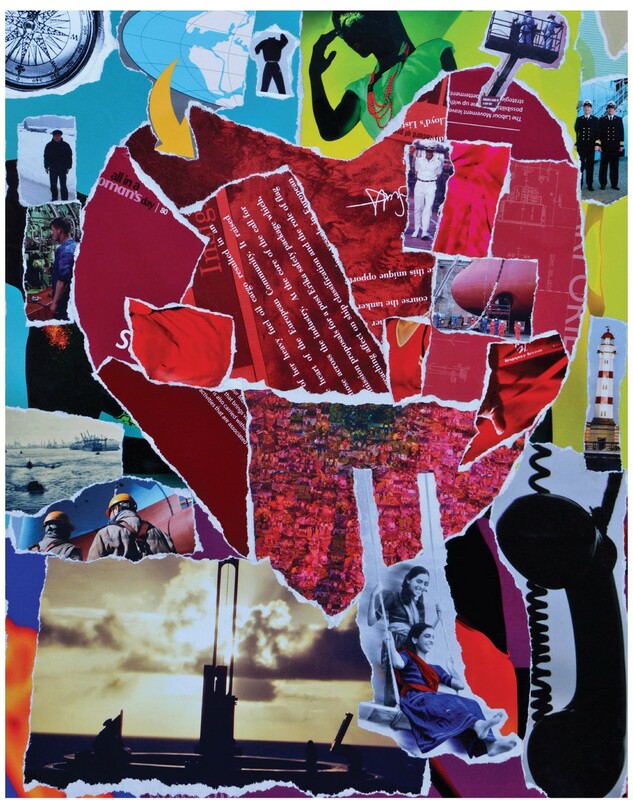 Gupta presented his work in a form of collage in which he pasted different pictures taken on different occasions on the ship and past photos of his family. He shared the joyous moments of his life where he daily watches the ship cutting through the loud waves, beautiful sun setting and disappearing and fresh sun rising. The compass and a map pasted depicted the visual art experience. On the other side, an image of a phone’s receiver and greeting cards depicted the painful and lonely life of the mariner who is living away from his family on a ship. He had also pasted a black and white image of his family that was another emotional element in his work. Mfundo Mbali Joseph, a renowned artist from Africa, painted his rural town, Joseph is resided in Rouxville, his home town, and where hunting for beautiful scenes to paint is his routine. 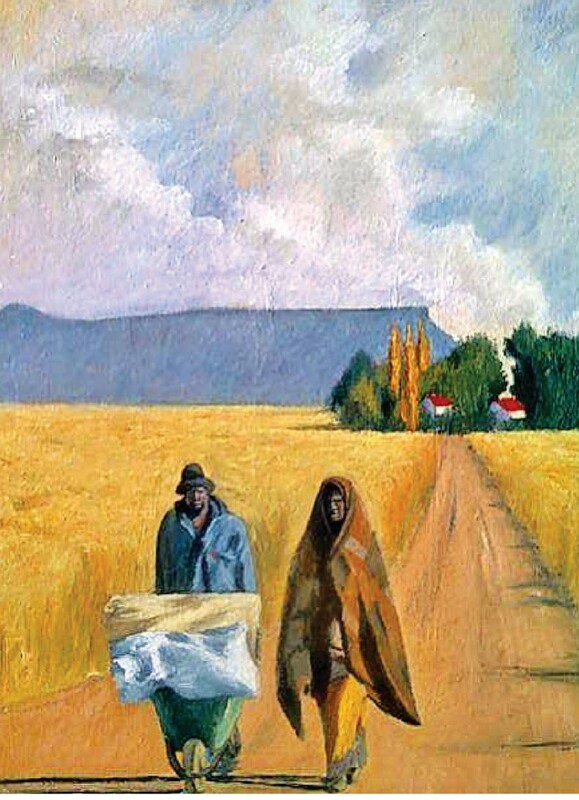 According to him, he daily walks around his town to hunt for scenes and takes pictures to later paint them on canvases and this art work in among those captured scenes. 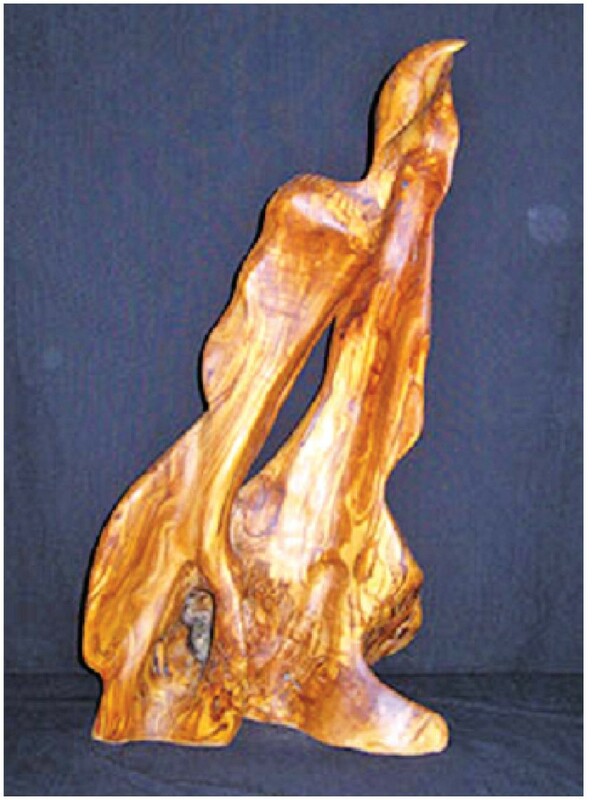 Abdelali Charir, a sculptor from Morocco, showcased one of his fascinating olive wood sculptures at the gallery. Charir experienced natural materials on which he used different techniques; His steady sculptures signaled the movement of contemporary Moroccan sculptures. These olive wood sculptures were loved by the viewers who could not stay away from the intoxicating natural fragrance of the olive wood. The artist also contributed to the Moroccon plastic art which had given him fame all over Morocco. Arvin K Davis Jr participated from the United States. His work rotated around children and their stories. His work seemed to be comical in which he brilliantly used loud hues to grab attention of the viewers. He beautifully played with loud hues, giving volume to his paintings. He painted water that is splashing the fish out of itself. The fine lines drew brilliantly helped to understand the jondra of the artist. Along with other artists from India, Nitin Khilare and Varun Goud also chose India to be the subject matter like other artists from India. Khilare, famous for his oil and acrylic paintings, highlighted the traditional and religious values. 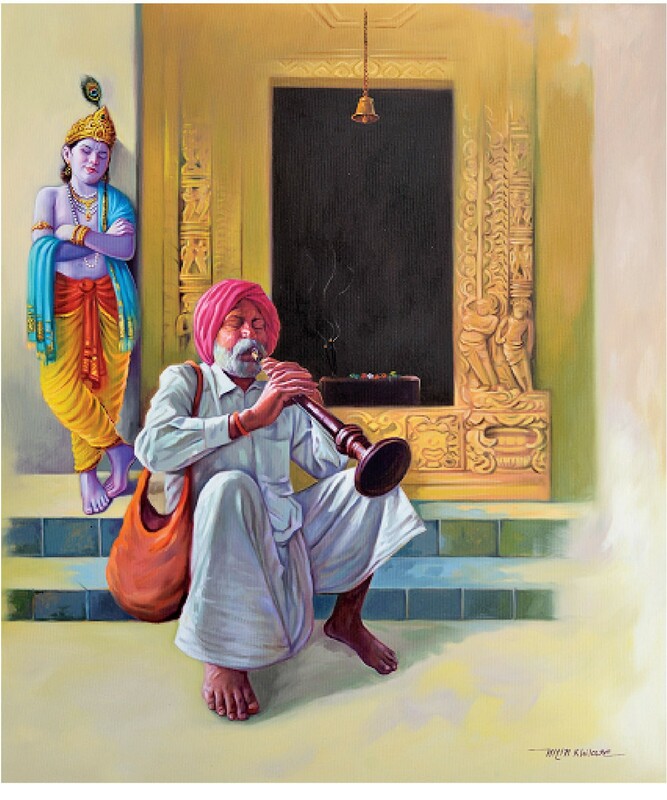 He painted a man sitting on the stairs of a temple, playing a musical instrument whereas the Lord Krishna (a major deity in Hinduism worshiped as the eighth avatar of the god Vishnu and also as the supreme God in his own right) is pleasantly listening to the sweet tones. Khilare masterly strokes, wise use of colors and bright soothing hues defined his understanding of the medium. He depicted peace and happiness in his work, whereas a little smoke around the characters created spiritual environment in the painting. Whereas Varun sketched the rural life of women in India. The background of the art work added strength to give it a view of a village. The detailed drawn figures of two women sitting on the floor, surrounded with the elements only found in village life were striking for the viewers. 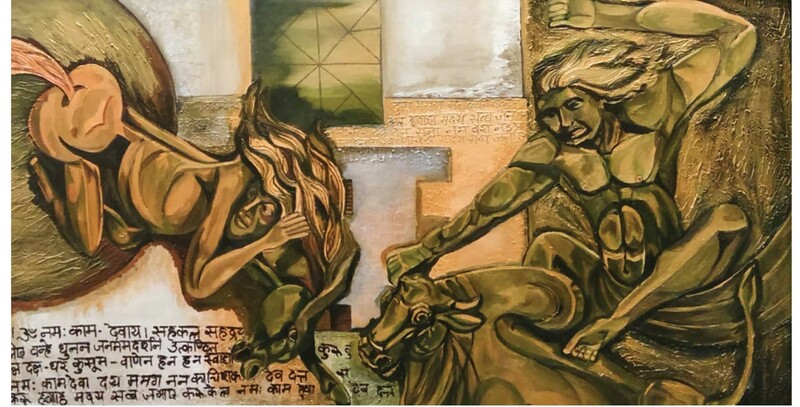 Tejaswani Goud painted two characters in earthy tones that are shown riding aggressively on bulls which she titled ‘Desire’. There was Hindi script written at the bottom of the painting which explained her work and the mood of the characters. 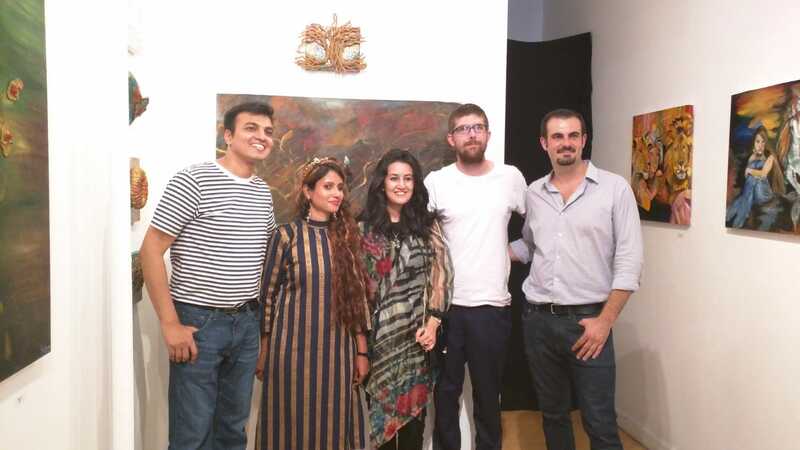 All these immensely talented artists got an opportunity to display their work at Dacia Gallery where they had an experience to meet other artists from different countries that helped them understand art, culture and tradition of fellow countries. No matter where the artist belongs to, which form they are practicing, which notion they are following, the only thing that unites all the artists and bring them on the same spectrum is ‘art’. “Art can serve as a powerful tool to bring the world together and promote world peace. However, this power is often underestimated.” Sirsat added. An exhibition that invites artists from around the world just only serves the purpose to promote peace, happiness and art so that this medium can only be used with a positive intention. No biennale, art fair or exhibition has ever taken place on political or racial basis. This medium itself speaks about peace and happiness.